The Force Awakens is almost here! There are only a couple days until the release of one of the most highly anticipated movies in recent memory, and the long wait will be over. But before then, you have some preparing to do. These 10 ideas will get you excited, prepare you for the movie, and share the anticipation with your friends! 1. Watch the rest of the Star Wars movies. Okay, so you don't have to watch all six, but you should, at the very least, watch your favorite one. Nothing will get you as psyched up as watching one of the best movies of all time! 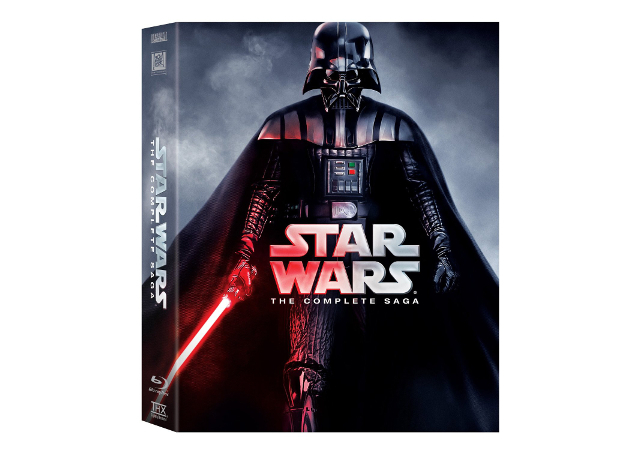 If you don't have Star Wars on Blu-Ray yet, now is a great time to buy it. 2. Watch the Star Wars Begins filmumentaries. Jamie Benning has created three "filmumentaries" that delve deep into the creation of Star Wars, from deleted scenes and alternate angles to cast commentary and bloopers. The format is unique in that it follows the film through its entirety, placing deleted scenes where they would have been in the movie—they're phenomenally well done, and definitely worth watching. 3. Watch all of the TFA trailers. A number of The Force Awakens trailers have surfaced, and they're all fantastic. Watch the first and second teaser trailers, the Japanese trailer, the international trailer, and the extended TV spot. If you haven't seen one of these trailers yet, don't worry—Disney and Lucasfilm have done a great job of not giving away any of the story in the trailers. 4. Play some Star Wars games. Star Wars games are the best. That's why we're all here on this site, right? No matter which Star Wars games you like, spend some time playing them this week. Whether it's The Old Republic or TIE Fighter, you'll be reminded of just how much you love the Star Wars universe (personally, I'm going to try to download a copy of Rebellion). 5. Make sure you have proper clothing for the premier. If you're going to a midnight showing, you'll probably see a number of people in costume for the movie. And while you don't have to go that far, I strongly recommend showing your love for Star Wars with at least a t-shirt (I'll be wearing one with an AT-AT on it). Not sure if you want to go all out and wear Star Wars clothes? This logo shirt is a classy way to do it. 6. Read a Star Wars book. If you have a favorite Star Wars book, this week would be a great time to re-read it. 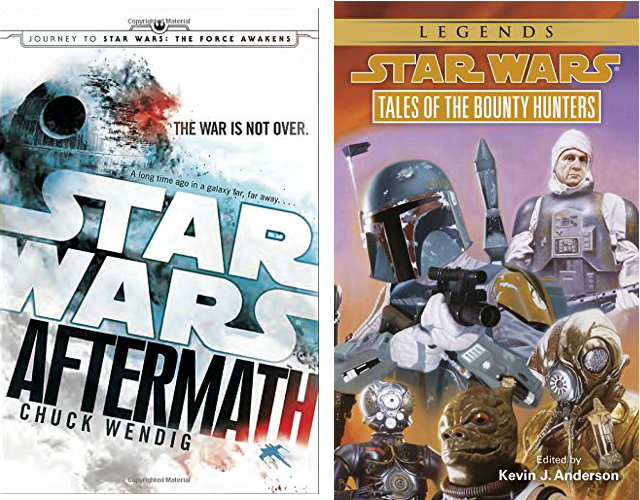 And if you want to get an idea of what the galaxy looks like 30 years after Return of the Jedi, check out Chuck Wendig's Aftermath, one of the entries in the Journey to The Force Awakens group of books released recently. If you don't have time to read a full novel, I highly recommend the Tales series of short stories; my personal favorite is Tales of the Bounty Hunters. 7. Download the Star Wars app. 8. 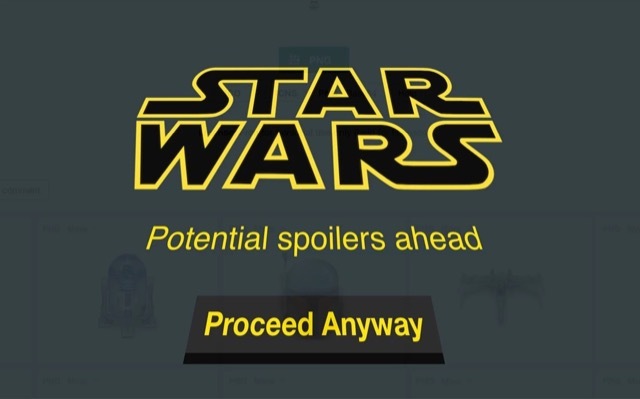 Download the Star Wars Spoiler Blocker Chrome extension. If this extension detects a Star Wars spoiler, it will block the page and let you know that you could be proceeding to a page with spoilers. You can then choose to continue or not. The extension tends to block pretty much anything that mentions The Force Awakens, but you're better safe than sorry! 9. Send Star Wars GIFs to all of your friends. Whether they want them or not, everyone in your contacts list should be getting a steady stream of Star Wars GIFs this week. 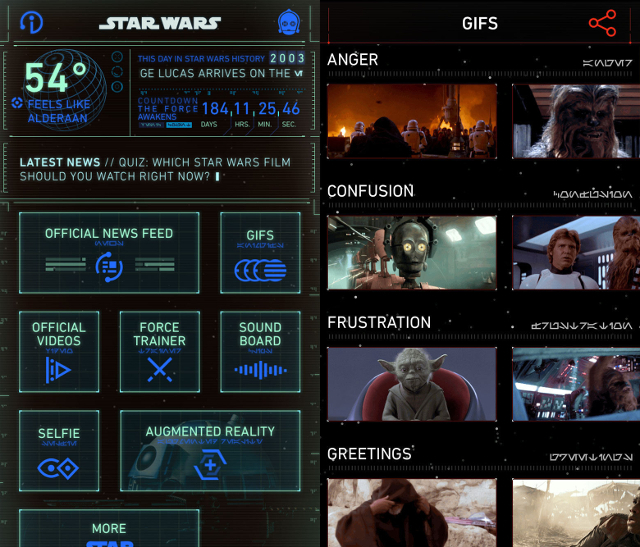 Check out Giphy for a wide selection, or use the Star Wars app mentioned above. 10. Play a Star Wars board game. 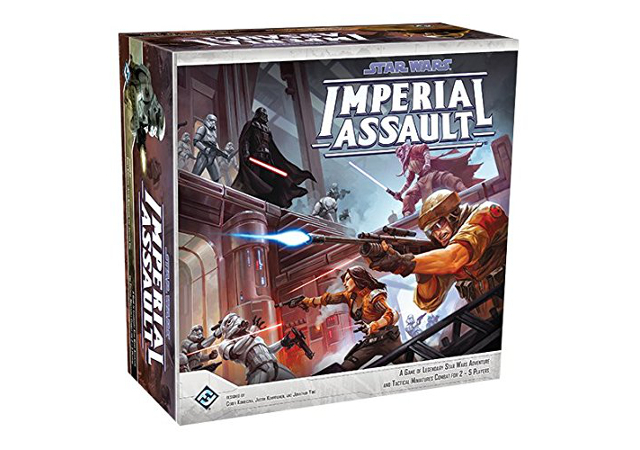 Imperial Assault and Armada are hot right now, but you can also play Star Wars versions of your favorite classics, including Risk, Monopoly, Battleship, and Sorry! And, of course, Star Wars Trivial Pursuit. Get some friends or your family members and have a game night! What will you be doing this week to get ready for The Force Awakens? Are you going on a Star Wars binge or just reading news online? Re-reading your favorite novel or checking out a short story? A video gaming rampage or a game or two on your phone? Share your plans in the comments below!